Over the past few months, several vendors have made high profile announcements about their IoT intentions. This post takes a closer look at their activities, what we can infer about their IoT strategies and likelihood of success. and, a set off activities focused on innovation in the form of an Open Innovation Challenge and IoT Lab partnerships with KT (S. Korea) and Oi (Brazil). The CEO of another vendor, Huawei’s Ken Hu, echoed Nokia Networks’ sentiment by making the case  for “the development and unification of cross-industry standards, cost containment and cooperation among different stakeholders”. In parallel, Huawei showcased  its “Agile IoT” architecture to stake its role with hardware designers of households and business appliances. The vision of Huawei’s Chief Strategy & Marketing Officer (William Xu) is to standardize infrastructure to foster the development of Internet applications, including IoT. Huawei’s Agile IoT architecture comprises a lightweight, open-source OS (Lite OS), agile IoT Gateways and an Agile Controller (which appears to provide software-defined networking principles to facilitate control over terminals, gateways, computing resources, applications and data). Meanwhile, a third vendor, Cisco, took a lead role in launching OpenFog  with a consortium of industry heavyweights including (ARM, Dell, Intel, Microsoft and Princeton University). Its intention is to accelerate the deployment of Fog technologies which, according to Wikipedia, enable computing services to reside at the edge of the network as opposed to servers in a data-center. OpenFog is in the early stages of stamping its presence in the IoT market and it has set out a broad mandate covering Fog computing architecture, test bed development and a variety of interoperability and composability deliverables that seamlessly leverage cloud and edge architectures to enable end-to-end IoT scenarios. 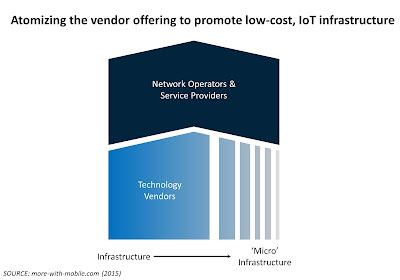 Tactically, a lot of effort is going into ‘atomizing’ the infrastructure that enables IoT applications, so that MNOs (i.e the service delivery partners) can offer lower entry-cost solutions to enterprise customers as a means of boosting adoption. This is fine in terms of long term operating cost efficiencies but there is a risk that companies will not devote enough effort to the value-creation reasons for companies to implement IoT solutions. Strategically, all companies say that they believe in standardization and partner eco-systems. However, there is no clear statement of intent on how to consolidate the multitude of standards and proprietary efforts in the market. Furthermore, while partner eco-systems can encourage implementation they tend to be localized rather than broad ranging affairs and they are rarely open. The big value creation opportunities in the IoT market occur higher up the value chain where the majority of revenues are concentrated. None of the vendor announcements, thus far, address the kinds of technical developments and innovation possibilities that will position them to capture a share of these new business opportunities. Nokia Networks’ is right to highlight the approach to standardization within 3GPP (which made mobile so successful). For the IoT to be as successful as mobile, companies need to collaborate in areas beyond the 3GPP remit. This means moving up the IoT value chain into the realms of services that enable IoT applications. Examples include FIWARE and oneM2M (both of which target the platform layer, above network connectivity) and HyperCAT (in the data management portion of the applications layer). Above the platform services layer, there is relatively little evidence of communications-sector companies getting involved in delivering IoT applications per se. To manage the IoT transition, companies need to have a clear view of the emerging IoT landscape and the new opportunities for value creation. 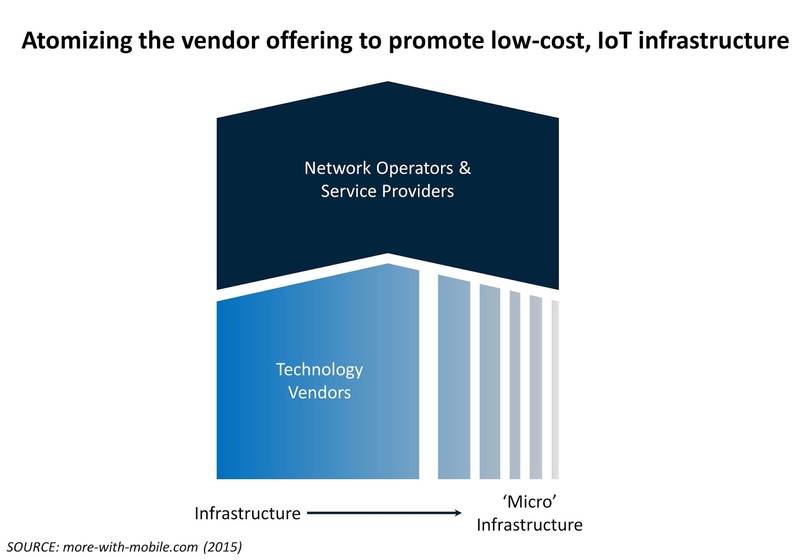 At present, vendor strategies focus on commoditization in the lowest layers of the IoT value chain. This will pay dividends if adoption rates rise at a faster rate than infrastructure price declines. It’s fair to say that we can expect these ‘early-generation’ IoT strategies to evolve as vendor views of the market opportunities crystallize.